Well, I stopped by the hospital and saw Don today. He was sitting up and watching a little tv from his chair. He's moving from the bed to the chair, although once there, he'd prefer to stay. We had a long talk about his surgery, and his daughter Lindsey was there to fill in missing details for me. He was under the knife for about six hours. He had 5 arterial aneurysms. They pretty much opened him up wide from just under his sternum to the tops of his legs. They removed 4 arteries and replaced them with... I kid you not.... kevlar. Yes, Don has boat parts on his inside, too! He's also bulletproof, if they shoot him from the inside and aim only at his artery. One of the arteries was supposed to be about 10mm, and it was 7 cm. That would be, in medical terms, bad. There is a 5th aneurysm, but they worked on it a bit, and they think they will probably only have to put in a stent, which could be done outpatient, and things will be fine there. While we visited, he was told they have a room for him in the regular ward, so he is out of the ICU. This is better for visits, and means he is no doubt better all the time. He will be in for at least a week, and then he'll be on recovery at home, so he will definitely want visitors. This could have been a really big deal. A good way to let you know how big is this-- If you have an aneurysm and it finally gives out, if you are not within spitting distance of a hospital, or in the process of being run over by an ambulance, they can't get to you in time to save you. You just bleed out that fast. Don (and all of us,) are very lucky that not only did he have a warning, but that he heeded that warning and got checked out. He was admitted and scheduled for surgery in about a 2 hour time frame. If you have ever tried to get hospitals to do something fast, you know what this meant. Don is in high spirits, although he knows it is going to be quite a healing process. He's also going to have one hell of an impressive scar. He's very grateful for all the thoughts and well wishes. He has no problems having a few visitors, although you might want to call first. Lindsey is, for the moment, strictly enforcing his cell phone/email ban (Andrew couldn't take more than an hour of that.) He is at Edwards Hospital in Naperville. Hope everyone is well; Don sends his best to all. Well, it was a beautiful season we had! 2011 started with a bang, got better, and then after Harbor Springs pretty much went to hell, but it was still good! Our 2nd place finish in the NOOD Regatta, with 3 bullets, and only 4 pts out of 1st place, was our best overall finish in that regatta ever. First in section over the finish line in the Mackinac Race, even though we were then corrected over by 5 boats, and Gauntlet with their big time advantage for stopping to assist with Wingnuts giving them 1st place, is also our best finish ever in that race. So we were corrected over. Dueling with Spitfire down the straits was an excellent finish to an amazing race. The first 36 hours was some of the best sailing we have ever seen. There is about half an hour of sailing in there that I could do without, (storm, wind, lightning, other good stuff,) but we sailed well and had a great time. After the Mac, though.... I'm not sure if getting our bootys handed to us in HS defeated us for the rest of the season too, or not. IT was pretty much downhill after that, though. That doesn't mean we didn't have a good time! The delivery to Waukegan was one of the best rides we had this year. 12 kts of wind out of the West, clear blue skies, and 80F. We had a consistent 7+ kts of boat speed, and thought we would speed up the lake. The wind died off earlier than planned, and shifted around to E/SE from it's prior lovely SW wind, so we motor sailed the last half. On the trip, we had good news... On their vacation in France, Matt proposed to Carly at the top of the Eiffel Tower!... Once again, the Maskwa/Dark Island connection continues to produce! Judi, you need to get some more single guys on that boat for the Maskwa girls! We had a great time going up the lake, and a bunch of us had to run and catch the train back. We left Carly, Matt, Don, and Chrystal to do all the work, while we lounged back on the train. Let's plan on getting together more often in the off season! Well, we are down to less than a week, and our Maskwa will be away at storage. Here is what we have coming up for sure. This Wednesday (tomorrow, the 5th,) Will be our last official evening sail. Boat call is at 1700, and we'll be off the dock for maybe an hour or so. We might even get a little night sailing in. This Saturday (Oct 8th,) is our delivery to Waukegan. I do not have a boat call/departure time as of yet, but we can plan on meeting about 0900 or so, and heading north. The weather forecast is for clear sunny skies and a high of 77F (or about 23 Liters, for you metric people.) If the forecast holds (and we all know the weatherman is always right!) it should be a simply lovely day to sail. We'll return to the city on Metra. There are return trains at 2, 4, 5, and 7, all at :10 after the hour, and a late train at 10:40pm. Fare is $6. Hope everyone has big plans for the off season! First off, everyone who sailed with Maskwa, with our good friends on Dark Island and Turning Point, is safe and sound on the Island. Maskwa was about 5 miles from the scene where Wingnuts went over. Our hearts go out to the 2 sailors who were lost on that boat, on that night. The storm was the worst most of us had ever seen, and according to George on TP, it was the worst he had seen in 50+ years of offshore sailing. We were first over the finish line in our section. Unfortunately, our handicap for this race is quite unfavorable, so we had 5 boats close enough behind to correct over us, putting us into 6th place. Gauntlet, who had passed us Sunday morning, and we had spent the day chasing down, was one of the first boats on the scene where Wingnuts went down; they worked to pull people out of the water, and search for survivors, so they were given time rewarded under redress for that action, placing them in 1st place. Considering that they were ahead of us at that point anyways, they obviously deserve that First Place position! We raced hard, and basically led the pack all the way up the lake, but we were simply not far enough ahead when the storm broke and then when we finished to win. Them's the breaks. It was a great race, and we had a fantastic time. The crew worked very hard. There'll be an email out when I write up the full report for the blog, but that's the basic info. Our hearts go out to the friends and families of the sailors who were lost on Wingnuts. The forecast for the Chicago - Michigan City – Chicago Regatta had been predicting 95F weather and high winds for a week, so we were all a little bit nervous when the weather was only in the 80s that day. Would the wind hold up? It would be nice to zip around the lake with 15+ knot winds for a 65 mile race. Race start was at 1955, and we had the #1 up, with the JT ready for action. With the forecast winds, it was looking like a “Jib Top-o-Rama” kind of evening (and morning!) but we were looking for maximum speed. We had a clean start, and good speed off the line, even though it seemed like the wind was dying off, just a little bit. After the first mile or so, we knew we would be able to hold the Reacher, so we readied that sail, hoisted, and accelerated away. Rounding the crib, our slight course change made it just a little too difficult to hold the chute, and we were better off cracked off a bit with the #1, so we shifted gears back again, dropped the spinnaker, and continued with excellent boat speed. Free Agent and On Edge were both just off and behind our right stern, and Runaway and Michela were low of us, with Runaway having a slight edge in speed. As night fell, the winds actually increased a little bit, and we shifted down to our #2 jib, still with a full main. The boat handles really well with a full main right up to 20+ knots of wind, so as long as we had the weight on the rail, we could still sail fast. A few miles out of Michigan City, the wind had lightened enough that we went back to the #1, and dropped the #2 down the hatch to clear the decks. We followed our progress with the GPS, so that we’d be ready to make our call in, and decide what we needed to do tactically to round the mark fast and head back even faster. We flipped the gear so that we’d be ready for the spinnaker on the broad reach we would have for the 3rd leg (Michigan City – Hammond,) and listened to the radios. 2 miles out, we heard Eagle’s Wings 1 mile call in. This was pretty good! After a 30 mile race, we were only 1 mile behind a well sailed Section 1 boat, that owed us a good 45+ seconds/mile. Not that they are in our section, but it’s a good yardstick to measure ourselves and our performance. We heard Runaway, who owed us quite a bit of time, as one of the fastest boats in our section, call in as I went down to make our own call in. We were right behind her in the dark. We were still regularly hitting numbers of 7.5 to 8.5 knots, so the night had been an excellent sprint. It was midnight, we had started at basically 8PM, and we were already across the lake! We rounded the turning mark in a tack, fell off, and… well… still too high to carry the spinnaker. Ouch, this was getting funny. We had just made a 150 degree course change, and the wind changed to once again be just a bit too far forward to carry the sails that would make us our fastest— essentially, our biggest advantage had to remain unused at this point. So, we settled in to trying to pick off the boats that were just ahead of us. We had a sprit boat that had been taking us up, had passed us, and we were chasing it down, our goal to pass it at some point. The funny part was this boat is Night Hawk, a boat that rates quite a bit faster than we do, but we did a good job trying to keep up with her! Eventually the wind came around again, and it looked like we would be able to send up our Spinnaker, so we got her ready, knowing we’d be strapped in pretty tight, but the speed advantage would probably be something we could make the most of. For the next 7 miles, we would regularly carry 8.5 knots with the chute up, but it was a very harrowing ride at 0200 in the dark. The Main Sail was basically just giving us a little push, and everything was being driven by a strapped in spinnaker. We could barely hold our course to the mark, which we could not see, especially since it is an unlit buoy. Who the heck decided that? Of course, we were still sailing fast, and if we needed to, Don could just feather up, we’d flap the spin a little bit, and then off we’d go again. Rounding the Crib to start the final leg just before dawn was breaking, we could hear the boats making their 1 mile call in from the finish. Lots of section 1 and 2 boats. We were about 2 miles from the finish and we heard Runaway call in. We could not recall how much time they would owe us, so we knew it would be close. It seemed as if nobody had passed us in the night; certainly nobody in our section. We had passed Princess M as we headed to the crib, and Jahazi the J120 was right in front of us rounding the Crib. They had sailed too high, and were just not fast enough deeper downwind to make efficient us of their big a-sail. We did a little fast sailing, and passed Jahazi (which rates 21 seconds faster than us) just a mile from the finish. I made our call-in, and we just worked at maximizing our speed over the last few hundred feet. 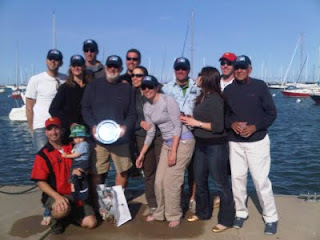 Jahazi never caught us, and it was a happy crew that took the finish 8 hours and 44 minutes after the start. We had sailed all night, and except for catnaps on the rail, pretty much nobody slept. Everyone put their energy into the race, and we knew we had sailed well. After getting the finish times, we had corrected over Runaway by nearly 2 minutes. First Place feels really nice. Well, the preliminary results from last night's race across the lake are in, and Maskwa is continuing to score well! Dig these results! We were right behind Runaway coming around the mark in Michigan City, and even though we fell another minute or so behind, it was never far enough ahead to bother us. It was an amazing, almost 9 hour long race for us. We passed Jahazi coming to the finish, even though they owe us 21 seconds/mile, and we just crushed Princess M on the 3rd leg. Your crew of Don, Adam, Andrew, Carly, Mary Ellen, Crystal, Ryan, Darren, Ute, and myself were beat, but very happy at the end... we knew we'd at least be on the podium, and another 1st place to put up for Maskwa! Well, I started to write this Sunday evening, but I did a retake of one of the races, and had a surprise waiting for me. We were mis-scored in the first race on Friday. We are showing as a "9th," but that had us finishing the race 2 hours later than the final boat in our section. This is why we were so surprised at the scoring, but we didn't dig too deeply into it. We should have been scored a "6th" place finish, and then we would have ended the regatta 1 point out of 1st place, instead of 4. We are still in second place, though... Go Maskwa! Friday morning started out nice and foggy. And cold. And wet. Perfect. How many races do we really want to do in the 90F+ degree heat anyways? We were showing 11 crewmembers all day, and it looked like we'd be using all that weight on the low side, to heel the boat. We had a bunch of experienced hands, though, so that made things fun. At the end of race 1, with everything going normally, but the wind suddenly piping up, we crossed the finish behind (eek) Whisper and Saucy, and then had 3 more boats 'correct' over us. When we went to take down the chute, everything was going well, but we managed to 'sky' the port Spinnaker halyard, so we were down to a single halyard for our sets.... could be dicey... if we lost another one! Race #2 went off perfectly with a 1st place finish, and in Race #3 we managed to sky the other spin halyard. So, it was a good thing that racing for the day was over, since we had lost both of our spin halyards, and if they had run another race, we would have been at a huge disadvantage. We finished the day with race results of-- 9th (actually 6th,) 1st, and 3rd. Done for the day at 4th place for the section. Saturday stared well. More fog. Wind. Rain. No stinkin' visibility in the fog, of course. Thank goodness for GPS! Saturday was our day to shine. We beat up on the boats at the starts, and managed to finish the day with 2 ripped sails, and 3 races finished at 1st, 1st, and 3rd. 2nd place overall for the regatta, and another day of sailing to go! Sunday's racing did not go that terribly well right at the start. We knew we were going to play a little conservatively, but we had room to give, and as long as we were up near the top in any races they did, we should finish fairly well. We managed to not break anything... or rip anything, or do anything else to cost Don the big $$, and finished 5th and 2nd. This was enough to give us a 2nd overall for the Regatta, losing out only to Opus Dei, one of those magic Olson 30s. They're even from Tennessee!! It was a great weekend, and we really got to test our mettle. We have never even finished on the podium for this regatta. For some reason, it always seems like it takes us a little while to get up to speed for the season; we usually do better after the Mac, especially the Verve. We had a great crew all 3 days, and everyone really busted their butts at every position. There was some blood shed, and some sail ripped and patched, and all kinds of madness, carnage, and mayhem, but we stuck it out, and got our first 2nd position on the winners stand ever in the NOOD. What a ripping good weekend! Joanna and Ryan participated in their first NOODs, and we were pleased to have a great friend in from Denver, Dave "Sabu" Gillespie, for all 3 days. Adam came out for the weekend, sailing his first NOOD, and just had a rock star bunch. Don, Carly, Andrew, Ryan, Dave, Caliente Mark, and I raced all 3 days. We had Nicole and Jim Stanton, Manny, Joanna, Ute, and Anna coming out filling in the gaps in our coverage, and giving us much needed talent. On another note, our good friends over on Turning Point won 1st place for their section, and for the Bene 40.7s, the NOOD are their North American Championships, so they get their boat name on the ship's hull trophy for the 40.7 NAs... Let's give a big congrats to them, too! Hope everyone had a great weekend... more sailing to come!! We're almost all set up for this weekend's regatta, the National Offshore One Design Regatta, sponsored by Sailing World Magazine. Chicago is the only regatta of this series that has a PHRF, or handicap section. We'll be sailing in PHRF 4. This puts as as nearly the fastest or the fastest boat in the section, which gives us an unbelievable advantage-- we can probably sail clear of anyone and get clear air, and that gives us the best chance to sail fast. It also means that if anyone finished ahead of us, they definitely have beaten us for that race. So, it is all up to us! We're full up every day. They have not published the handicaps for the boats, although we do know some of them from many many years of sailing. We should have quite the advantage, I hope. Now we just have to exploit it. I've added the handicap of the boats that we know.... when you consider that we rate a "72," we're already at least 20 seconds/mile faster than half the boats in our section. Well, some email problems seem to be gumming up the works here... while I get to the bottom of that, here is the latest. Due to some commitments, we're not sailing tomorrow (Saturday.) Sorry if some of you were still planning on it for practice, but sometimes, things just get that way. This will be our first major regatta this year. We traditionally do well in the long distance races (well, that should hex us nicely.) It looks like we'll have a good crew, and we'll be starting some newish people off, so that will be exciting! Boat Call is set of 0800. We have a little bit of work to do to get ready for the race, and our warning is at 0930, and we start 0935, so it is vital that we are off the rock by 0830. I will be down quite a bit earlier to make sure that we are all set up and rigged, and the boat is organized. Normally it takes a few races to get into the swing of things, so those of you who are coming, let's get cracking. Bring your foulies... doing a 6+ hour race in the rain is not a refreshing experience. Email me or call if you have any questions! There was some delay in the airport on Wednesday, so it is good that we did not plan on getting out on the water. However, the following is the plan for Saturday and Sunday. Saturday, looks like some rain later in the day. I will be at the boat by 10:00am. Plan on tuning the rig, and fixing some items and then hopefully the weather will allow some sailing time in the afternoon. A little rain will not stop the sailing. Bring foul gear. Sunday, I have some family commitments in the morning so will get down to the harbor about 1:30pm. Plan on sailing shortly after arrival, since most work will have been completed on Saturday. Supposed to be sunny with moderate temperatures. Should be a good day to shake out the wrinkles. Will have a plan for the remaining days of sailing as we ramp up for the season. We can discuss over the weekend. Wednesday will be our first beercan. Hopefully we can get a full crew for some racing . MASKWA is on the dock. We are now in the EG dock, same dock as last year, different letter due to some new slips in the North end of the harbor. It was a cold and windy day, but the sun appeared for the first part of the trip. After a few last minute items, we headed out into the water. The gusts to 35 knots were rather brisk but it was rather calm with 15-20 at the end of the trip. The west to southwest wind minimized the waves, but since the rig was not well tuned and properly inspected, it was a day of motoring. Crystal began the day driving in the heavy gusts, but the cold wind made her turn the wheel over to Adam get a feel for steering with less play in the rudder. As a newbie, he stayed out in the cold most of the day enjoying the driving. Of course Crystal and Carly also had a chance to come out of the cabin to get the feel as well during the later part of the trip. Crystal made some terrific sandwiches to keep us going. I just kept warm and dry. Thanks to Carly, Crystal and Adam for a wonderful trip. While we were working on the mast today, Don noticed that the "Sheeve" at the top of the mast for the jib is not quite right; it had a lot of play in it, and it should be stable. The guys at Larson's are working on that right now, and we'll be up and running when it is delivery time. Life jackets are mandatory. Right now we have who I know is going at the bottom of the list. The weather forecast is calling for strong winds out of the South the day/night before, so it'll be a good thing not to have to do the delivery early. Hopefully the winds will pass through, and the seas will have a chance to die down. You will need foul weather gear. Layers are good; more layers are better. With no wind, you can count on a 5 hour trip at the very best, and more likely a 7 hour trip if the winds are anywhere close to the bow. Plan accordingly. Plenty of people to bring the boat down. I am pretty sure that one of Don's brothers plans on doing the ride, too. So far there is no need for food; plan on someone sent for a food run before the boat leaves the dock. Well, looking at the start of Sailing Season 2011, it's going to be a bit sparse. We have the delivery from Waukegan to BPYC scheduled for May 1st, with rain dates of the 2nd and 3rd. After that, we will have at least 1 weekend practice; it's still a bit to cold out to be doing our Wednesday night practices, but we may schedule something to keep us fresh there. Out first 'Regatta,' we will actually be Race Committee for, and that is the Abe Jacobs, on Sunday, May 22. This used to be a 2 day event, but there are not a lot of boats registered for the regatta anymore, so it has been condensed into 1 day of racing to shake the cobwebs out. More details to come there, but things are still up in the air because of what's going on with Area III anyways... but plan on R/C that weekend. For those of you new to the boat, R/C work involves setting up the race course, judging the starts and the finishes, and generally having a good time and horsing around on the boat for hours at a time. We don't sail it, we judge it. It's a great way to learn how races are run, and what is expected. We will not be doing the Spring Opener or the Olympic Cup, so our first real race will be the Long Distance Classic on Sunday, June 5th. (Wow!! So Late in the Season!) The schedule has been in quite a flux, but this is how it is panning out for us at the moment. We will try to get a practice sail in on the weekends, to get us up to speed. Directly follow the Long Distance Classic, we'll be dropping off those who cannot take any more, and then spinning out to finish the racers coming back from the St Joe - Chicago Race. We could be on the water until very very late, so if you can't stay, then when we are done with our race, you can hop off when we go ashore to resupply the rum. The Wednesday Night Beercan Series starts with the annual "Tune Up" Regatta on the 25th of May, and then the 17 race series starts on June 1st. This is the best time to come out and learn what we are doing. That is all the news at the moment. Things have been kind of slow, and the boatwork is mostly done. Don needs to make sure the rudder is installed Tuesday (tomorrow,) or at the least we will be directionally challenged. Rudders are difficult to install once the boat is in the water.